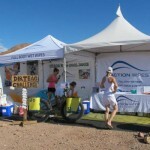 We here at Prologue Cycling Magazine have always been fans of Oakley sunglasses. We have owned several pairs over the years and have always found them to be great, although expensive, sunglasses. After years of use, our most recent pair of Half Jackets was swiped at the local gym, “Thanks Jerk!”, so we decided it was time to try another model out. 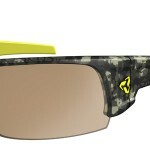 We recently purchased a pair of Oakley Flak Jacket sunglasses and have been testing them out for about two months. We are very particular about the shades we use for riding and racing. First they must be comfortable; nothing else matters if a pair of sunglasses pinches your temples so tight you start to see double. Nosepieces can also be a source of discomfort if they lack proper padding or are too tight, creating pressure across the bridge of the nose. Second, they must have great optics; nobody wants to be racing in a local criterium, brushing shoulders at 30mph with distorted vision. Third, and somewhat less critical, they need to look great. 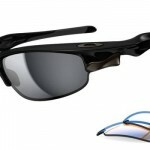 Oakley has a wide range of removable lenses available for the Flak Jacket. Our glasses came with jet black/black iridium polarized lenses. 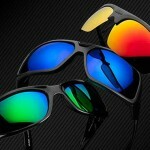 Oakley designed these lenses for use in, “”Extremely bright light. Excellent all-purpose lens for sunny conditions. Offers truer color perception. Features an Iridium® coating to reduce glare.” We are very impressed with their clarity, glare reduction, and overall performance in bright conditions. Clarity was especially noticeable, which is nice when the pace picks up and everything is coming at you quicker. 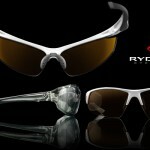 These glasses also provide great peripheral vision which is very handy when riding in a group. Despite being designed for sunny conditions, we have used these glasses in all conditions from overcast days to waning daylight at dusk and have found them to perform suitably in most light conditions. On one ride, when a sudden storm blew through the area, these lenses were a little dark so in the future we would probably carry a spare set of clear lenses with us if there was a chance of rain moving in during the ride. For those looking to ride at night or in rainy weather you can also purchase a spare set of clear lenses, which we have found to be very useful when the sun goes down. You may not need protection from the sun after dark but it is nice to have something to protect your eyes from the cool air, bugs, and any other airborne objects that could cause irritation or damage. We have tried out many sunglasses that just won’t fit our face or are very uncomfortable to wear. Luckily, we have not come across either of these issues with the Flak Jacket. Obviously, all glasses won’t fit all faces but these work really well for us. The nose piece comes with two soft, rubber covers that provide a soft contact point where the glasses meet your nose. This This helps eliminate pressure points on the nose you sometime get with frames that don’t provide padding for the nose piece. These rubber pads also allow the frames to grip the face better providing less opportunity for the frame to slide around on the nose. This creates a more secure fit. The glasses also come with an extra set of covers just incase you need to replace them. Similar padding is located on each arm of the frames which also helps to provide extra comfort and grip to prevent hot-spots and slippage. Many times we find that the front of our sunglasses fit either too far forward on the face, feeling as if they are hanging off our nose, or smashed up uncomfortably against the face. These glasses seem to find the sweet spot for us. They sit close enough to keep the wind and sun out of your eyes but still leave room for some airflow. These glasses fit very comfortably, so much so that you can easily forget you are wearing them. 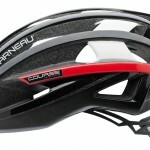 They are perfectly comfortable for long days in the saddle. Oakleys have always been know for their sleek design. The Flak Jackets are no exception. The sleek black finish combined with a mix of sharp angles and smooth curves might not make you faster, but they sure look like they should. The design remind us of a stealth fighter jet. The frames are made from a relatively durable plastic that, in our experience, stand up well to long-term use. This is truly a case of “you get what you pay for”. These glasses do come at a premium; you could very easily go to the gas station and get a pair of 12.00 glasses at 1/20th the price of these Oakleys. However, you will notice a difference in quality, trust us. After our last pair of Oakleys was stolen we decided to try out a pair of sunglasses we found at the local gas station. They looked great and were very comfortable. Quality issues were immediately apparent though. We paid for the glasses and slipped them into the pocket of our gym shorts. When we got back into the car and pulled them out, the lenses already had scratches on them! We aren’t sure how that happens when there is nothing else in the pocket but sure enough, they were showing small scratches across the lenses. We wore them around and on rides for several weeks. Aside from the scratches causing slight view issues we were pretty happy with the visual optics (although there was significant difference between the Oakley lens quality and these). Then one day while we were out to breakfast a waitress brushed against the glasses and they snapped like a dry twig. So while we did save some money on the sunglasses we don’t feel they were worth the 12.00 investment to only last a few weeks. We have been much happier with the Flak Jacket and assuming they don’t get lost or stolen, if history is an indicator, they will last for many years under normal use. The Flak Jacket is comfortable, lightweight, stylish, and rugged enough to take some light abuse. Many of the parts are replaceable which is nice when lenses eventually start to show some scratches or the rubber pieces start to show some wear. We wouldn’t hesitate to recommend these Oakleys, or any other models for that matter, since we have have been using their sunglasses for many years and haven’t run into any issues with these shades.